What could be better than taking your iPhone out of your pocket and seeing that one of your loved ones (or friends) is calling you for a friendly chat? Well, instead of seeing just their name and boring static picture showing up when the call comes through, how about making the whole incoming call process more fun and engaging by adding a song and a music video from your favorite artist or band? That is exactly what the new VUZIQ app does that has just landed on the Cydia store. 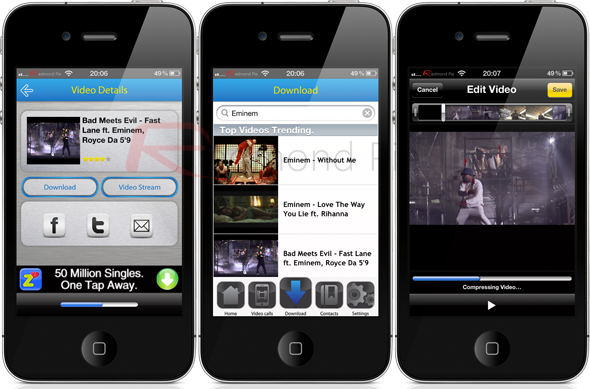 When this free of charge package is installed upon a jailbroken iPhone, users can search for and download music videos of their choice and set them to play when an incoming call is received. VUZIQ makes use of both the audio and video of the downloaded and selected file, meaning that the ringtone of the handset is altered to suit the video audio. VUZIQ is extremely simple to use and operates as a fully, self-contained app on the device that requires an initial but seamless registration process. Once registered, the polished user interface offers a main home screen as well as additional video calls, download, contacts and settings views that are all selectable via a dedicated button at the bottom of the app. The setup of the app is pretty self explanatory with users being able to search for a video of their choice, download it to the device and then select it to play for every incoming call or set specific videos on a per contact basis. The settings option of the app allows users to opt-in to social sharing services like Twitter and Facebook as well as a few configurable settings like setting videos to hook into FaceTime calls as well as making them full-screen. The initial home view offers a display split into two halves with the top section containing a horizontal scrolling bar with the latest news from the music industry and the bottom half showing your downloaded videos. So there you have it ladies and gentleman. VUZIQ, a Cydia app that actually brings very fun to use and attractive video ringtones to your iPhone. The app itself is very good and is definitely highly recommended considering it is free. I found two issues while using it, firstly, that when answering a call, there was a small but noticeable delay between the accept button being pressed and the actual call coming through over the top of the playing video. Also, if you are using the popular CallBar tweak it renders the VUZIQ video ringtone service useless. VUZIQ is available as a free of charge download from the BigBoss repository with no specific iOS requirements being mentioned.